COAL CITY – A St. Clair County woman was killed Thursday after a tree fell on her single-wide mobile home during a storm. 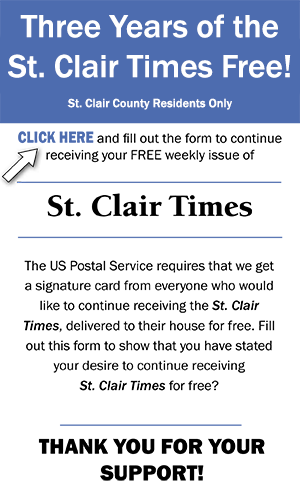 St. Clair’s preliminary March rate was 3.4 percent, down from 3.6 in March 2018 and 3.5 in February 2019. PELL CITY -- Pell City High School’s baseball team swept Minor in the first round of the Class 6A playoffs Friday. Hello, my friends, I hope this finds you well. I’m a little bummed that the Triathlon was cancelled that I was supposed to do in Gulf Shores on Saturday, but I remind myself that things happen for a reason and, besides, I can’t really swim that well in 25-foot waves anyways. For the fifth year in a row, St Clair County’s High School Culinary Arts program can claim a state championship. Located at Moody High School, the team recently won the Alabama ProStart State Competition in Culinary Management. The play, “Victory of the Cross,” written by Loretta Brasher and Denisha Clark, mother and daughter, will start at 6 p.m., Saturday, April 20. Doors to the church in Pell City will open at 5. Nicholas Gandy is new pastor at Friendship Baptist Church in St. Clair Co.